~yarnalong: Just a quick note today! My littlest has been acting out most of the day, off the wall crazy, and just a bundle of energy. When we sat down for our reading time after lunch, he brought a pile of books over to me on the couch, and requested that we keep reading even after the timing went off. He told me that he wants mommy time. After reading through the stack of books, he wanted to watch Llama Llama and be with momma, so that's what I'm doing! I'm spending time with him on the couch, reading more stories and getting in a few rows of knitting while he plays and chats! It's kind of nice to have a built in reminder to take a moment, have some breathing room, and just slow down. And hopefully he will be back to his sweet self after being recharged with lots of momma time! I started a new design piece this week and it's just breezing along on my needles. I'm on quite a "magically inspired" kick here lately and taking even just 30 minutes to work on this in the morning makes me smile and brings so much joy to the start of my day. I absolutely adore Alice in Wonderland, and my husband purchased this kit for me for Christmas, originally, then he forgot about it and then it ended up being an extra Birthday Present after my birthday was once again forgotten by certain people......so it has already brought much love and happiness to my life! 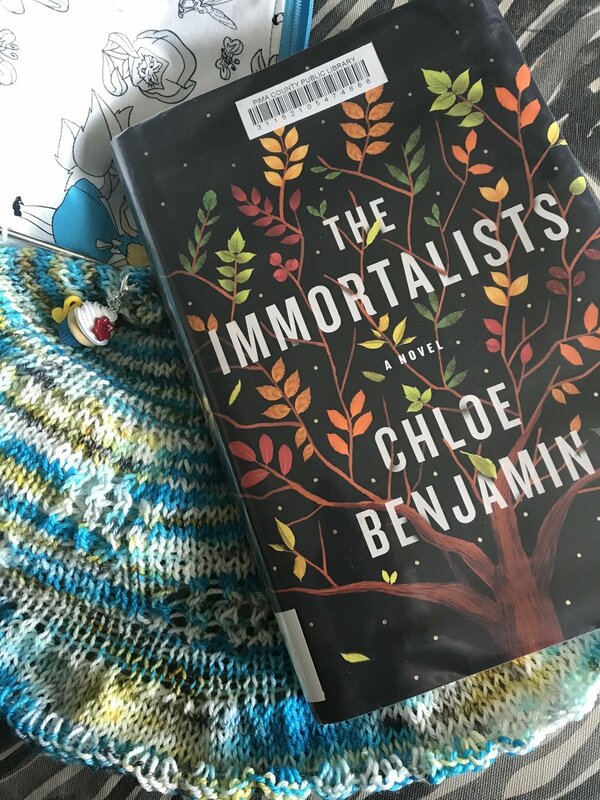 I found this book, The Immortalists on the Short Term Loan shelf at the library. I remembered seeing it on some knitting blogs and in a few knitting shops, so I was interested in reading it. I'm only through the first portion of the book and I am finding it quite interesting so far. Well, I have to get back to my little llama, I would love to know what you are reading and knitting this week! And I hope that you have a chance to spend some time with YOUR little llamas, if you have them, and that you don't feel guilty or stressed for taking the time. It's been a good reminder to me as well that I need to prioritize my time with my littlest guy first thing in the morning. Oh how he loves a good story, and that is my favorite way to start the day! Have a lovely week, knitting friends!